Jim Rash had been basking in the glow of the new George Clooney movie The Descendants, which the comic actor-writer penned with Nat Faxon — until the film got skunked at the Gotham Awards on Monday. Bummer. But there will be other awards shows, of course, and very soon. 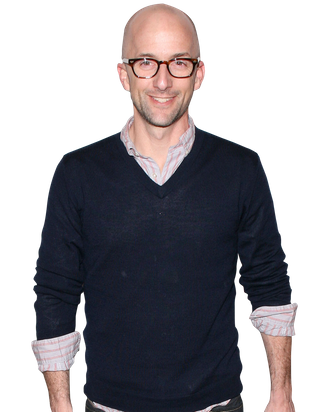 More pressing is the fate of Community, the NBC series in which Rash plays the kooky Dean Pelton. The show has an avid fan base, but many enthusiasts appear to be watching on demand or online, thus muddling the all-important Nielsen ratings. And now, Community suddenly finds itself in a scheduling limbo that could portend its end. The fans are fighting back with an Internet movement called “Save Community.” As for Rash, he thinks the key problem for his and other shows is the dated state of ratings technology. He talked to Vulture about all of this over the phone, while driving in L.A. I hope it’s okay, but I’m calling you from the car. So long as you don’t crash! Wouldn’t that be a better story if I did? [Laughs.] Don’t worry, I’m hands-free. I promise I won’t crash and die. All I can do is promise, though. If I break my promise, we can’t exactly have a follow-up about it. Congrats on the Independent Spirit Award nomination for your screenplay for The Descendants, by the way. Hopefully that makes up for the film being shut out at the Gotham Awards. Yes, I just found about that! It was one of those things where I got a call, a very quick message from someone going, “Congratulations! Call me!” and you’re like, “I guess I better, to find out what the congratulations are for.” I didn’t even know about the Gotham Awards until you just told me, but yes, that will make up for it. It’s all just icing on the cake. It’s all very exciting. I don’t know what I’ll have to do [for the awards season campaign] other than show up to screening Q&As and mingle at toasts. So far it hasn’t been too stressful. I haven’t been asked to remove my clothes yet. No costumes! [Laughs.] Somehow, my two careers have not crossed streams yet. I could force my hand and say I came straight from the set: “Sorry, I had to wear this.” Something crazy and revealing, with high-heeled pumps? “Sorry, I had no time to change.” Maybe a Carmen Miranda costume, that’s tropical enough to fit with a Descendants-Hawaii theme. Or Tina Turner. She can fit in anywhere. Why not? Fox Searchlight would probably be thrilled with the attention it would get. And then you could cross pollinate the campaigns: awards campaign for The Descendants, and Save Community. Yes! Anything to sort of remind people that we want to stay alive. By the way, Vulture made some Save Community posters for you. I know! Those are great. Are you selling them? Um, I think they’re free to pass along. Where would the money go? I guess it wouldn’t make sense unless you gave the money to a charity. Or to us. If only money could save us. We need people. I’m sort of feeling the message is, or what you can only say is, “Watch us.” Watch it live. Watch it in three days. Whatever the rules are by which we have to survive in order to be counted as Nielsen ratings. It’s a bigger issue than a save-this-show campaign, because this has happened before, say with Arrested Development, which deserved better, and this issue can’t just keep repeating itself. It was one thing with Friends, back in 1994, to get an audience of 30 million people in their time slot at 8 p.m., but people today, especially a young audience, watch it online. Technology has changed, and we need to figure out how to improve the archaic way of what makes a hit, or how to determine how many viewers are watching beyond some people with Nielsen boxes in a small percentage of homes in random areas. Do you think the show, being as meta as it is, will somehow address all this outside turmoil creatively? Perhaps along the lines of when Abed freaked out about Cougar Town? I would not doubt that [creator] Dan Harmon already has something in mind. He has a history of putting things in like that. I’d be curious to see if it alters the grand scheme in any way, since we were mapping out this year like The Wire. But I’m not suggesting anything! I don’t do that. I love the writers too much to impart any of my opinions on them. This is just my playground. Sure, there are characters you care about, but if they want to have a zombie attack or whatever, the core relationships will just grow from that crazy environment. On the one hand, this is a show about a study group, but the story doesn’t have to always fit that mold. So what if zombies attack? But I know I’m just preaching to people who clearly understand that. Some critics say it is that kind of randomness and the rabid fan base that doomed the show. I hear that. Some people will ruin a movie for you if they enthuse too much. But the unfortunate thing [either way] is, if we need people to stay at home and watch it live, then we’re fucked. Getting back to The Descendants: Since you were more known as an actor at the time you got the job to co-write the movie, how did the gig even come about? Nat and I were talking to Alexander Payne about another project — The Way Back, now called The Way, Way Back — and our script for that was similar tonally and also tapped into a skewered family. He had already optioned the book The Descendants, and so he gave us the book to read and asked what we thought, and then he asked us to come aboard. So it really just fell into our lap. What are some of the challenges with that book? Besides getting rid of the mom flashbacks? Scottie [the youngest daughter in the movie] was much more of a presence, so we had to cut some of her scenes, like where she’s doing things with her breasts, and how she was mimicking her mom, because her mom and her sister were models, and we took that out. Did you have George Clooney in mind when you were writing? No, but Alex did. And that worked for us!